Turn onto Armand Hammer Blvd. (former Firestone Rd.) and proceed to the Home Depot shopping plaza, on the right. Our building is on the right when entering the shopping plaza. 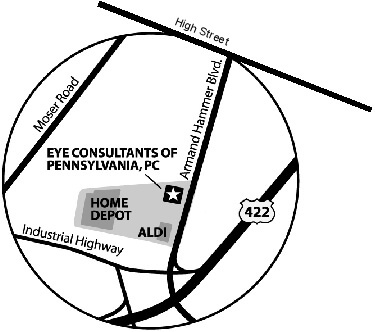 Exit route 422 at the Armand Hammer Blvd. exit. Turn onto Armand Hammer Blvd. (former Firestone Rd. ), toward High Street. Proceed on the Blvd. to the Home Depot shopping plaza, on the left. Our building is on the right when entering the shopping plaza.